Please see the link at the bottom of the page for Moebius oil recommendations. Wide range of applications for cuckoo clocks to tower clocks. The recommend shelf life of this product is 3 years. MOEBIUS 8030, For Small Clocks, Music Boxes, Time Keepers and similar fine quality movements, which are not exposed to winter temperatures. The recommend shelf life given by Moebius of this product is 2 years, however reports from professional suggest 2 to 3 times more shelf life. Keep in dark place not exposed to light and at stable temperature to prolong shelf life. MOEBIUS 8031 use for same applications as 8030, however for clocks exposed to lower temperatures. The recommend shelf life of this product is 2 years. Quicken® NanoLube Clock Oil 2 ml. Specifically formulated for horologists. NanoLube contains NanoDiamonds. The NanoDiamonds act as ball bearing, eliminating friction and wear. Over time, standard chemical lubricants break down cake-up and stop lubricating. 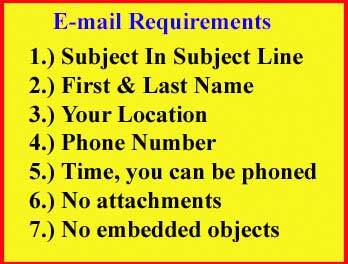 NanoDiamonds are .1 to 4 nanometer synthetic diamond ball bearings that never wear out. NanoDiamond adhere to the applied surfaces even after the carrier oil has evaporated, reducing friction and preventing wear. On average, it takes 80,000 NanoLube particles to span the width of a human hair - and all particles are spherical, synthetic diamond. 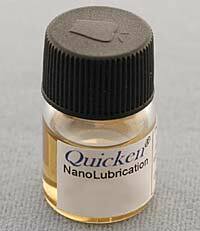 Quicken® NanoLube Watch Oil 1.5 ml. Since World War 1, American Made Nye oils have been the American Strategic high precision oil producer eliminating any dependence of foreign oil. Due to the monopolistic nature of the Swiss Watch Industry, and Moebius is own by these companies. Only Swiss oils can be found recommend in Swiss writing, likewise German promote only German oils as well. Nye Synthetic clock oil is superior to any natural oil produced anywhere in the world. Nye Synthetic Oil Product Prices have gone up in 2011, however Nye Oil is quite inexpensive when compared to Swiss or German Synthetic Oils. Moebius 8200 is for mainspring barrels and has been a long-time standard for manual wind watches. When working with automatic watches you may get better results using Moebius 9020 or Moebius 9141. Moebius 8200 can also be used on stems and winding gears of older manual wind watches. Moebius 8300 is for mainspring barrels and has been a long-time standard for clocks of all sizes. Moebius 8300 is slightly thicker than Moebius 8200 and is used in mainspring barrels of watches when 8200 is deemed too thin. Moebius 8300 can also be used on stems and winding gears of mechanical movements from all sizes from small 5 ligne watch movements to large tower clocks. 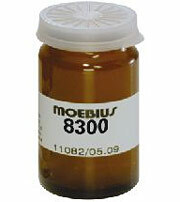 Moebius 8300 can also be used on winding gears of quartz watches.